Binance is happy to announce the launch of our crypto-to-crypto over-the-counter (OTC) trading desk. Our OTC desk allows Binance users to trade larger amounts of many cryptocurrencies listed on the exchange, with transactions being settled via their Binance accounts. Email us at tradedesk1@binance.com or join us on our official Telegram channel https://t.me/BinanceOTC to know more about Binance OTC services. Why Trade Via Binance Crypto OTC? 1. You are able to quickly trade large quantities of cryptocurrencies in a single trade. 2. You can save time by clearing your trades at one price. 3. Your trades are private because the order books will not be touched. 4. You will benefit from direct settlements into your Binance account with your OTC trades; no need to handle different wallet addresses. 1. We specialize in crypto-to-crypto trades, across more than 80 cryptocurrencies listed on Binance. 2. We constantly endeavor to offer quick pricing for your OTC trades, with simple and quick settlement processes. 3. We have a broad and diverse client base as an effective distribution platform. 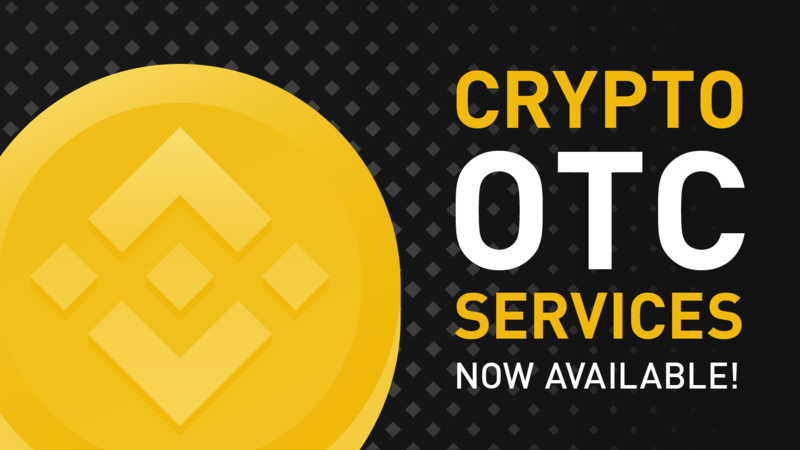 To take advantage of Binance OTC services, contact the OTC desk at tradedesk1@binance.com or join us on our official Telegram channel https://t.me/BinanceOTC.